Get ready for grilled cheese nirvana! April is National Grilled Cheese Month. What better time to introduce this beauty of a sandwich to the world? You could settle for a regular, Joe-Schmoe grilled cheese, or you can try this version! The perfect blend of sweet and savory, with a decided POW! of BBQ tang, makes this sandwich the king of the lunch table. Sit back and prepare for cheesy heaven on a plate! Preheat your oven to 350 degrees F, and line a baking tray with foil. Put sweet potato rounds in a medium bowl and drizzle with oil, cinnamon, paprika, salt, sugar, and maple syrup. Toss until evenly coated. Place sweet potato rounds in an even layer on the foil lined baking sheet and bake in preheated oven for 15-18 minutes, until soft. Once sweet potato rounds are finished cooking, begin assembling your sandwich. Start by lightly buttering the outside of the 2 slices of Udi’s bread with butter. Next, evenly sprinkle the shredded Mozzarella cheese on the inside of one slice of bread. Top cheese with 3-4 sweet potato rounds, 4 thin slices of avocado, 2 slices of tomato, and 1/4 cup baby spinach. 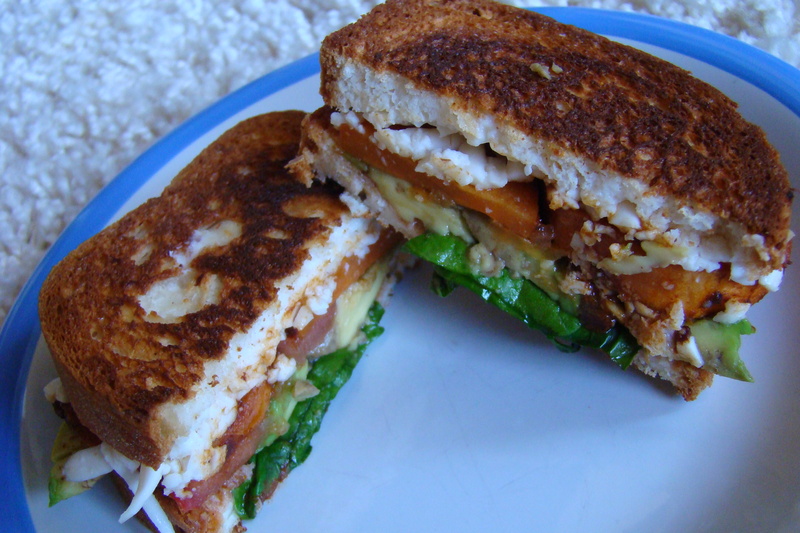 Spread BBQ sauce on the inside of the second slice of bread, and place on top of the spinach. Heat a skillet sprayed with non-stick cooking spray over medium-low heat. Place sandwich in the skillet and cook until desired level of char is achieved and cheese begins to melt. 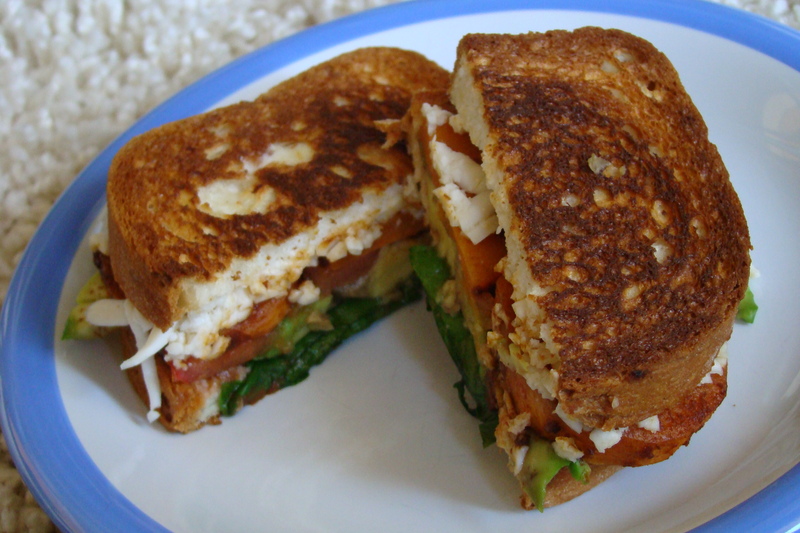 Using a spatula, carefully flip the sandwich and continue cooking on the other side until done. Enjoy! Have a be-UDI-ful day! Ohhh….God! It feels like forever since I ate a pizza. We started making our Grilled cheese sands on our George Forman grill, works real good, this should work there also. I;m going to give it a try. sounds very yummy. can it be made for diabetics? Enjoy your posts! I am also avoiding lactose and glutin and am new to this and finding it very difficult.